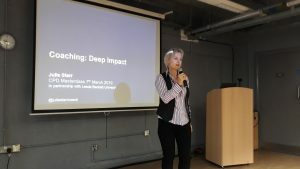 This week I had the chance to attend a seminar at the Leeds Coaching Network featuring renowned coach, writer and speaker Julie Starr. 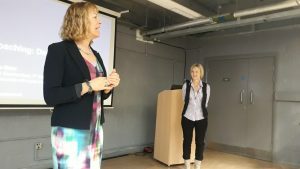 You may be familiar with some of Julie’s work including; ‘The Coaching Manual’, ‘The Mentoring Manual’ and ‘Brilliant Coaching’ and the session was everything you expected it to be. I like the simplicity of the slides used here, some simple but provocative questions to get going and made me think about what I wanted beyond ‘I’ve got an invite to hear Julie Starr speak, it’s bound to be good’. Within this there was also a useful distinction that may help ILM students distinguish between coaching and mentoring. Julie pushed against the idea of defining these two distinct practices behaviourally but rather, explore the differences in the relationship, Mentoring being defined by Benevolence (Mentor) and Respect (Mentee). What Goals do you have for your Coaching? As we explore on the ILM Programme you are always encouraging the client to step up one level. This led to thoughts about the lower levels and the effort exerted by the coach in helping the client find a solution. As Julie pointed out, at novice level we are working too hard to do this, ‘efforting’ is now a word in my own vocabulary for this. Efforting means we are encountering resistance – I think both our own and in the client. We need to be mindful that change can only come about through Inquiry. Julie used Miles Downey’s analogy of those sprung loaded plate dispensers you see in hotels; the coach lifting each plate (a thought) and that somewhere in the stack is a realisation of something that leads to change. Be willing to ask Questions you don’t know the answer to. A question is an offering. 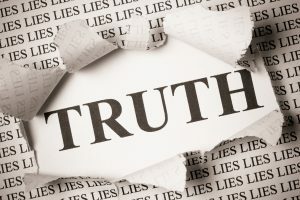 In being brave and asking questions we ourselves don’t know the answer to, we are likely to create change. How can we be successful at what we do? Julie talked extensively on 3 ways we can achieve greater success. Professionalise your approach – highlighting the difference between winning a new assignment and not, this was all about the practice and process of your coaching programmes, helping the client to understand what’s involved and how it works. Let them know your ‘formula’ to help them. Self-Development is at the heart of everything you do. Enough said! In working with clients these should be met with compassion and care. In terms of ourselves we should notice our own internal dialogue. We don’t speak to others the way we speak to ourselves. If your friend spoke to you the way you speak to yourself, they wouldn’t be your find. The sweet spot is the coach operating between Summary and Silence but (and this is helpful) when ready you can move to Observation, Opinion and even beyond. This allows you to be ‘clean’ about it ie.to publish “can I offer an opinion on this’ … rather than use a Strategised Question to nudge someone in your direction of thought. 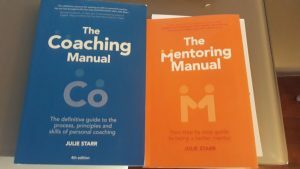 In summary the session was very well received, it had enough relevant content for coaches at all levels, novice to mastery and I highly recommend you access some of Julie’s work for your own coaching practice and ILM assignments, please see the recommended reading below. I hope this short summary encourages you, I found lots to be reassured about and also it offered enough new aspects to take away and develop. Finally, many thanks to Kathy Ashton and the People Development Team at Leeds Beckett University for inviting me to attend.